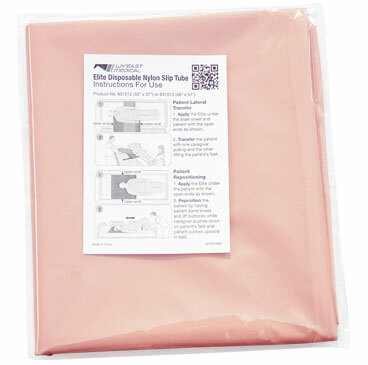 The Pink Slip Elite is a friction-reducing device used to aid in repositioning, lateral transferring and many other patient handling maneuvers. The Pink Slip Elite is made of durable, woven nylon with an anti-friction treatment developed by Wy’East Medical. It is designed to minimize the coefficient of friction which makes it extremely slick compared to other transfer assist devices. The Pink Slip Elite is single-patient multi-use. Safety: With no lifting needed, caregiver injuries are reduced. Comfort: Soft, providing the patient with a much more comfortable transfer. Easy to Use: The Pink Slip Elite design provides itself with its own working surface. There is no other equipment to struggle with or hunt down. Efficient: Only one caregiver is needed for transfer or repositioning in most cases. Versatile: No weight limit, making it the tool of choice in almost every repositioning situation. Assist your patient in getting them out of bed. 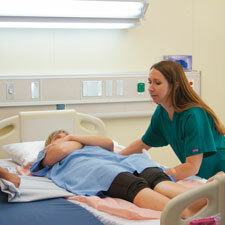 Use early mobility to assist in patient recovery. Use the Reusable Slip Tube to get your patient in and out of bed.